As TV shows get older, they often face the Sisphyean struggle of sustaining the initial premise while spinning up new story ideas to keep viewers excited and hooked. Though So Weird doesn’t last as many episodes as other shows, it too reaches a point of aging at which the basic beats of a So Weird story can be reverse engineered. Variation in the show’s late-game comes in the form of style and in revisiting one of So Weird‘s biggest strengths: an ability to tackle abstract concepts through concrete stories. “Gone Fishin’,” the last truely isolated standalone episode of So Weird, borrows its story ideas from two of the show’s better outings: the Civil War-themed Bigfoot episode “Sacrifice” and the all-time great “Werewolf.” The former episode involved a not-quite-monstrous man living out his days amongst the ruins of his old home which had been torn apart by war. The similarly so-called “monster” of “Gone Fishin'” chose to stay in his home despite the flooding caused by the construction of the dam that destroyed his home. The latter episode focused less on the titular monster and more on the metaphorical conflict that monster represented. The problem with the approach in “Gone Fishin'” is that the story takes too long to really get going. While there are some good atmospheric scenes and at least one exciting sequence when Annie and Jack reel in the old key, the stakes of the plot aren’t established until within the third act. 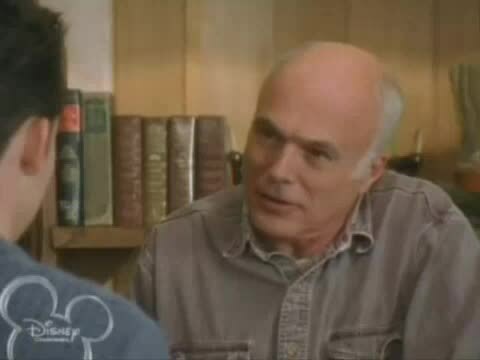 The episode, then, relies upon its guest performers, in particular Battlestar Galactica‘s Michael Hogan as the owner of the lakeside property Annie, Jack, and Irene rent for the weekend. As Sam Hardy, Hogan is well-equipped to portray a man who, faced with bankruptcy, turns an old guilt into a “monster,” a reflection of humanity’s destructive nature. The show hammers the theme home far too often, but it remains essentially true: George Dunn (the man in the lake) isn’t a monster, he’s just made out to be one by others looking for an external source of blame. At the center of this whirlpool of backstory involving geology and stubborn trappers is Annie, who hears George’s story amidst all the fantasy talk of creatures from the black lagoon. It’s also true that as shows age, they settle into a comfortable groove, capable of churning out episodes that look different but are in fact quite similar to those that came before. Weirdly, “Gone Fishin'” writes this into the episode by separating Molly for an entirely pointless B-plot in which she searches for the words to a melody. That’s a very fitting analogy for attempting to write for a show with over sixty episodes under its belt. Fortunately for So Weird, the show has one last new melody to play; in the meantime, though, the show can find solid ground by playing word salad with prior successful episodes.